Sterling Pharma Solutions receives its award from Derwentside College. A pharmaceutical developer and manufacturer has been given an award for its commitment to staff development. Sterling Pharma Solutions, based at Dudley, has received the Exceptional Commitment to Training Award from Derwentside College. Over the past two years, it has worked closely with the college to help its staff obtain qualifications in areas including performing manufacturing operations, cleaning and support services skills, management, leadership and customer service. So far, 60 of the company’s employees have enrolled on NVQs and apprenticeship frameworks designed to help them further their careers. 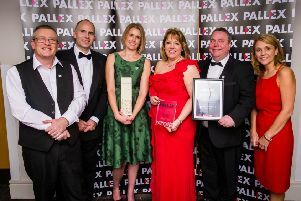 Kevin Cook, CEO at Sterling Pharma Solutions, said: “We’re delighted to have been given this award. The progression and professional development of our team is really important to us and so it’s great to be recognised for the work we’ve been doing. “We have a history of ‘growing our own’ employees at the site. Many of our senior members of staff began their careers as Sterling apprentices nearly 40 years ago. “We recognise that through training and development we can develop managers and leaders of the future and that’s what we’re continuously working towards. As a result of its training programme a number of Sterling’s team have received promotions and many have moved up the company’s internal grading system, which aims to give individuals more responsibility and greater long term career opportunities. Susan Errington, executive director at Derwentside College, said: “The exceptional commitment that Sterling has shown to its team’s development meant our assessors couldn’t single out just one student for the award. Sterling Pharma Solutions specialises in developing and producing active ingredients for drug products for drug developers all over the world.